As you all know its Diwali month, I’ve been quite curious about the subscription boxes that are were to reach my doorstep. 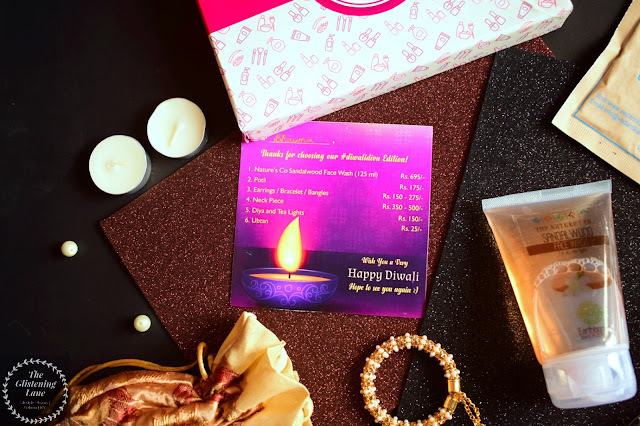 I love how subscription boxes ensure to add in that glitz of festivity within your monthly parcel to make you festive ready and fill your day with unbounded joy! For me initially, only Fab Bag existed as subscription box providers. And in case there was a month wherein I did not like the products showcased within their sneak peeks, I’d give that month a passé and not order anything just for the sake of getting something. Since recently, I’ve gone all out to experiment with different emerging subscription boxes; the reason being consistently same products or a lipstick as the only makeup product. Apparently, Sugar Cosmetics has a permanent flat within the apartment of Fab Bag. And even though I really like their cosmetics, until it’s a new launch, I don’t wanna go with a restrictive choice. So, in my exploration for a unique concept, I ended up with Hamper Hamper box. I’ve ordered from them once before and there a lot of the things which I love about them. Firstly, their parcel has more than four layers of packaging to ensure no spilling or damage occurs within the transit. Of course after this if any mishappening occurs, at least I know the brand is putting efforts on its end. Also, team of Happy Hamper is quite supportive when it comes to such a situation. And that’s actually what each customer desired because who’s got money to throw within the drains? That too after Modi’s Campaign of withholding black money, anyone? 😋 *Just Kidding* If I’m not wrong, in month of August they were mainly dealing in skincare items but now they’ve taken on-board the genre of lifestyle. This is why this month you are likely to receive – 5 Beauty, Jewellery & Festive Products. 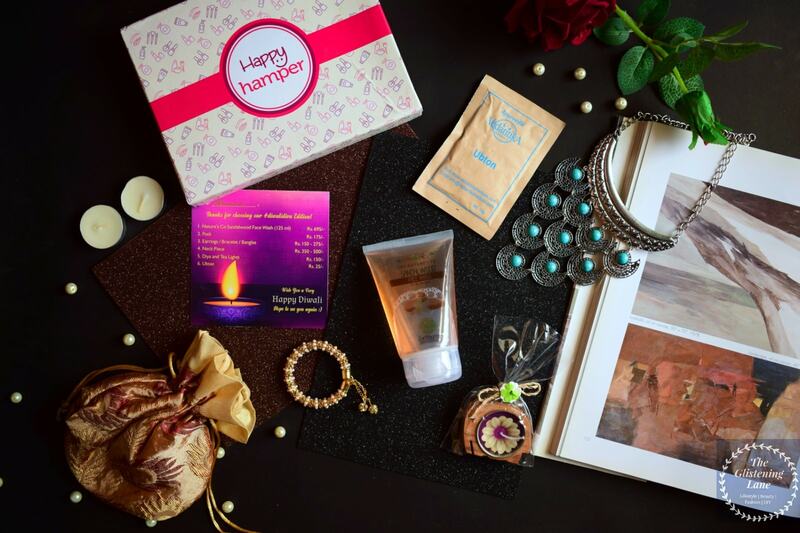 Buy Online: To order your October month’s Happy Hamper, click HERE. This face wash is quite huge in size and I loved it’s orangish hue within the packaging; synchronizing it with sandalwood which is the main constituent of this cleanser. It is meant for all skin type and the consistency of this face wash is slightly liquidy. Because of this, I always end up with not the desired amount of content that I wanna take out. But the effects post wash with this is really amazing! It makes the skin super soft and glowing. Along with freshness, you’d see no traces of makeup (non-waterproof) or dirt left behind. It’s a great pick for the upcoming festival of lights! I’m glad I received this within my hamper. 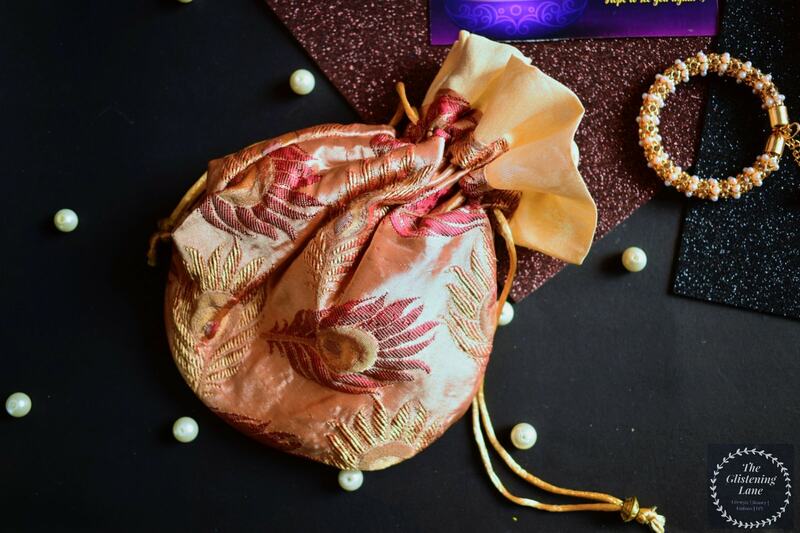 Now, receiving potlis is definitely a new concept. In case you don’t know, this potli isnt tiny in which you keep your earrings. This one is a large potli with a well constructed base. It has interplay of golden and brown colour which gives it such royal festive vibes! What occurred to me on setting my eyes on this is to use it for diwali gifting purposes. You can incorporate a good amount of dry fruits or probably some chocolates and that way it will look utter fancy. Another gifting idea would be to give beautiful candles packed within this. I’m sure there’s no one who wouldn’t like some scented candles; especially for the fall season. While placing an order, there was a query about wrist size wherein we were to disclose our wrist size. I choose the smallest one because my wrist is comparatively small for no specific reason. I liked how wrist size was taken into consideration instead of sending everyone the same cuff or bangles which half of them will struggle with due to incorrect size. And in such a scenario, ultimately the bangle would sit & rust within the corner of your jewellery collection. But that was not the case here. My bangle has intricate golden frame with white stud and pearls onto it. Also, there’s a cute little charms hanging to it. This piece isn’t meant for an everyday basis but with ethnic wear, especially on some occasion, this will look superb! Also, the opening and closure mechanism is quite convenient. For some reason, I like to call this the star piece! This neck piece can now be selected by you while ordering from the website. I received a silver neck piece which has four step layers running of charms onto it. These charms are carved into crescent moon shape and they have been embedded with light blue beads. Also, the neck piece is kinda vintage with its silver and oxidized appearance. You can pair it with a plain black or white tee and it goes so gorgeous with your outfit, giving it that bohemian feel. For closure purposes, there’s a chain so that you can adjust how short or long you wanna get this onto your neck. I’ve given you enough hints that I love hoarding candles; scented or otherwise! 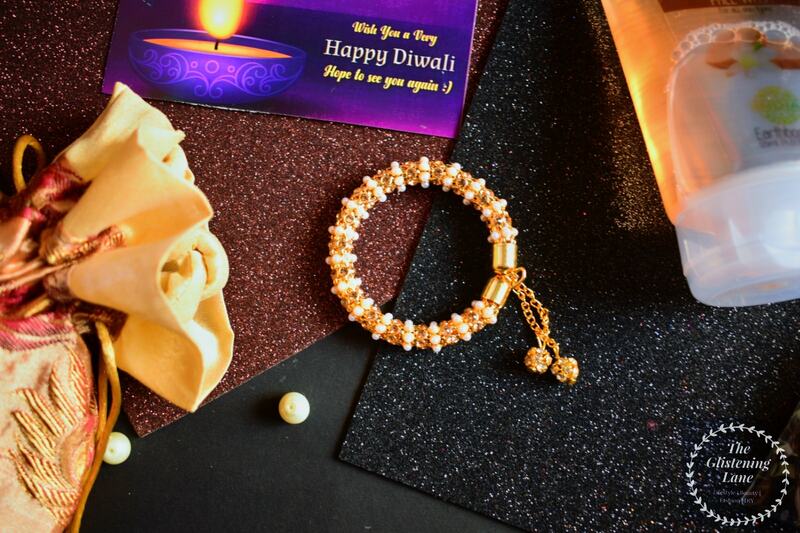 The diya that came within Happy Hamper is packed in an adorable manner. It has a plastic film packaging with a rope like ribbon. 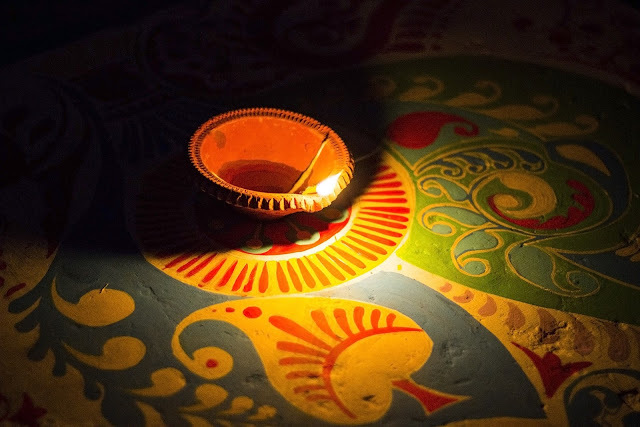 The diya is unusual in itself. 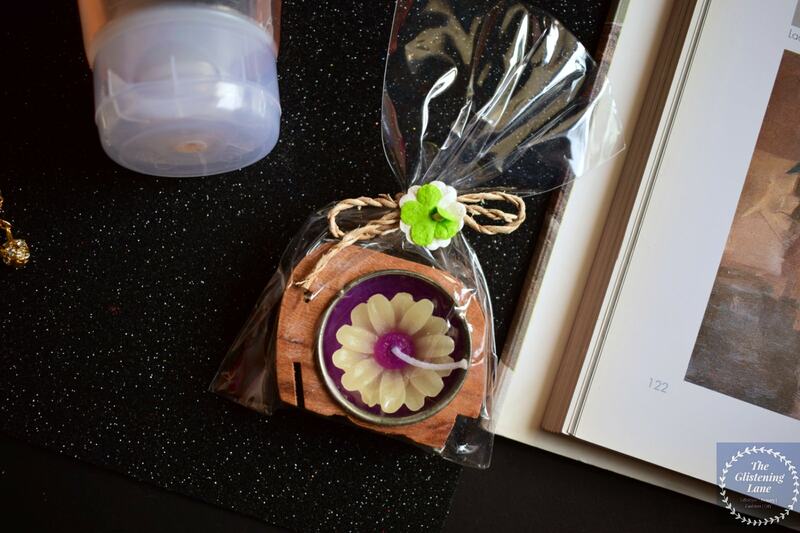 Instead of the kacchi mitti base, this is a wooden diya with a flower shaped candle plugged inside. On appearance it looks so intricate that I’d rather use it for flatlays and not really burn it. 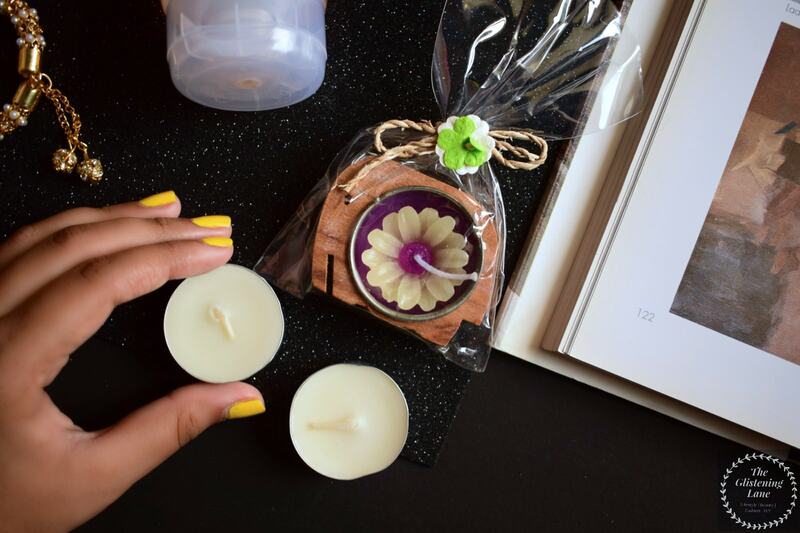 😁 Also, it comes with two pair of white candles which you can use within the diya once its original flowered light burns out. 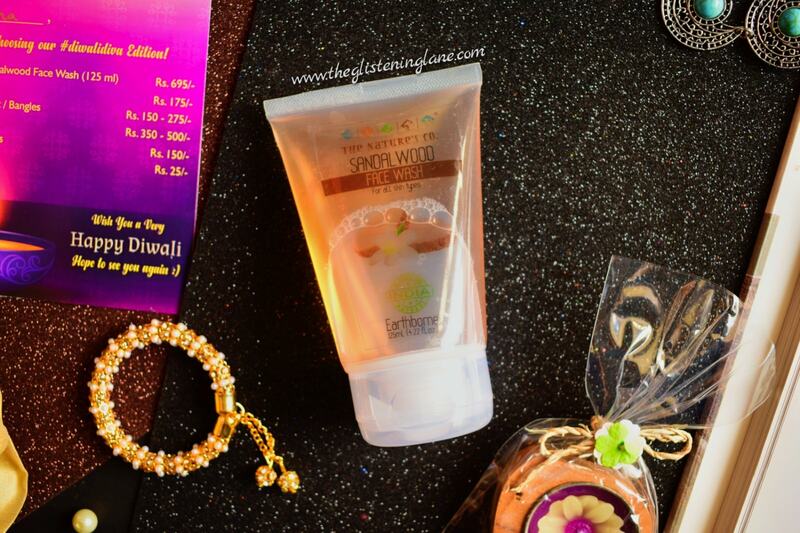 This is a festive suitable product which we’ve received within Happy Hamper in their #DiwaliDiva Edition. I’m kinda confused with this one; if this is a sample size product or a full size thing. 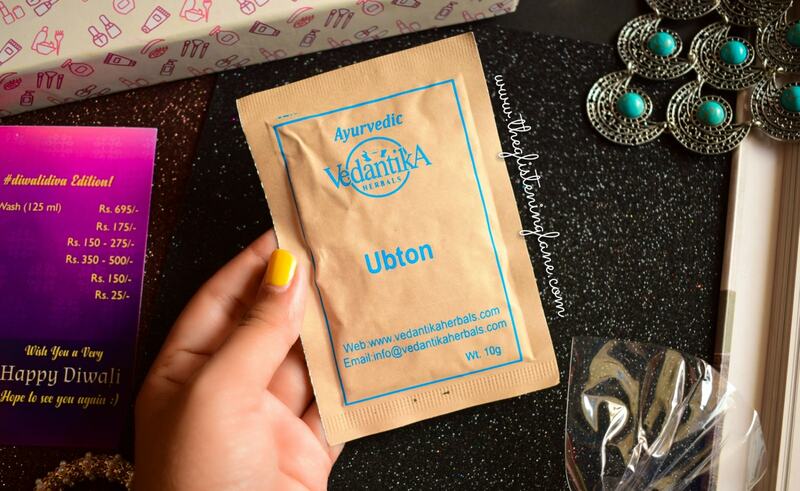 But I’ve seen the brand Vedantika Herbals sending these to a lot of people so it shouldn’t be sample. I’ve used Patanjali’s Ubtan and that worked fabulous for an exfoliant; it did subtle down my body’s tanning. The one within Happy Hamper seems to be meant for face and it says helps to minimize scars, black heads & blemishes. I do have scars left off from acne attack so I’m eager to try this. Happy Hamper is a team of six individuals who have a mission; a mission to discover amazing products from all the best and upcoming brands currently in the market and to get them for their subscribers. 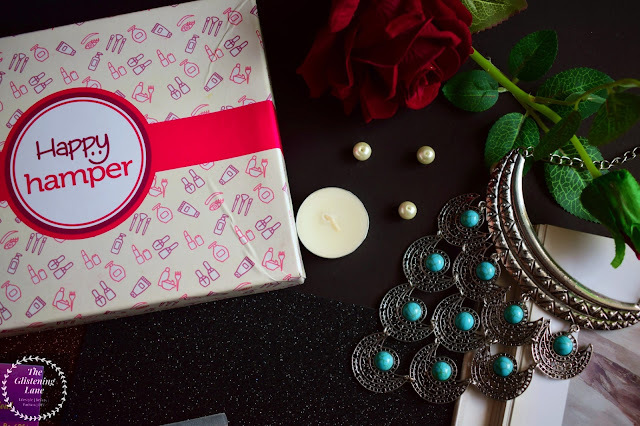 Our aim is not to be the cheapest subscription box in India, or a luxury provider, or a bad with multiple free samples; instead, we at Happy Hamper try to bring to you the products that you would love to use and would definitely wanna buy again. 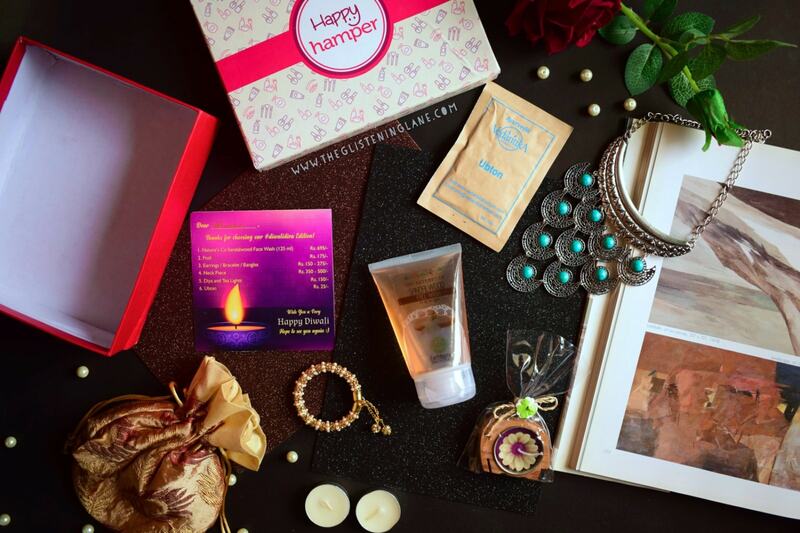 We want to make Happy Hamper, a true Discovery Box. Our expert team at Happy Hamper explores the market and reviews the brands which are amazingly awesome and tried to get them for you. Hence, each month you will find your hamper being a mix of new as well as popular brands, so that you can enjoy the best of both worlds. Would I Re-Order from Happy Hamper?